Welcome to the first Berlin. 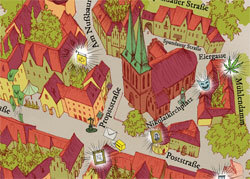 The Nikolai Quarter is the origin of Berlin. It attracts visitors as the city's historical old town and a colorful, creative district. Here, each day is a unique experience. Many events, such as Nikolai-Festspiele or the Berlin Festival Books attract visitors - as well as the oldest church, the shortest street, the most beautiful street corner, the most photographed monument or famous personalities. Stroll in the car-free streets. Browse through stores you'll find nowhere else. Forget time in small cafes and historic restaurants by the Spree river.